The Golden Era of Brooklyn can be traced back to the '50s, when the Dodgers were always in the World Series against the Yankees and The Honeymooners with Jackie Gleason as bus driver Ralph Kramden captivated the nation. 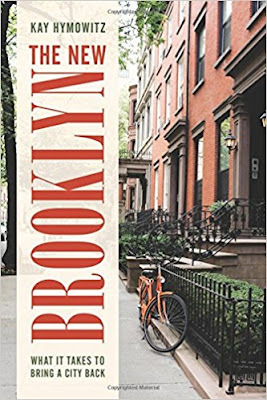 Brooklyn began its comeback in the 2000s, and the borough is now home to trendsetters, celebrities, and is back in the big leagues with an NBA team, the Nets, who play in the Barclays Center. Kay S. Hymowitz is the perfect person to document The New Brooklyn, as she moved to Park Slope over 30 years ago, when it was a far different place than the one currently known for French restaurants. Hymowitz writes, "In 1982, I moved with my husband and our two young children into a partially renovated brownstone in the Park Slope neighborhood of Brooklyn. We were part of a small but growing group of young college-educated parents arriving in the zip code just thirty minutes by subway from Manhattan, stripping the graying varnish from mahogany woodwork, replacing linoleum kitchen counters with butcher block (before granite was vogue), gossiping with neighbors about local schools while our children raced up and down the scarred sidewalks and climbed the century-old stoops. "We newcomers knew of Saint Xavier only because it sponsored our children's little-league teams, but it remained the religious and community center to our white working-class neighbors who celebrated Saint Patrick's Day with dancing and corned beef, in smoke-filled pubs like Mooney's on Seventh Avenue. Little did I know at the time that I was a harbinger of a New Brooklyn, about to all but swallow up our neighbors' old version. "In truth, Old Brooklyn was in big trouble way before we moved there. Near Park Slope was a more notorious Brooklyn - and it was too close for comfort for some newcomers, who packed their belongings into the family Volvo for a one-way trip to New Jersey or Westchester. When my children went to overnight camp in Maine in the late 1980s and revealed where they were from, suburban bunkmates would respond, 'Brooklyn?! Have you been shot?' They hadn't, I'm relieved to say, but they had to learn 'street smarts' to spy the punks intent on pushing them to the concrete in order to relieve them of their backpacks or simply to impress their friends." The book looks into the evolution of Brownsville, the growing Chinatown of Sunset Park, and Caribbean Canarsie. Hymowitz writes of how these neighborhoods relate to each other and who is polulating them, "Like other prospering American cities, New York seems to many almost a fortress of inequality. It's Bill de Blasio's 'tale of two cities' - white versus black and Hispanic, rich versus poor, pimped-up condominiums versus crime-plagued housing projects, or, in terms of Brooklyn's geography that I've described so far, Williamsburg versus Brownsville, Park Slope versus East New York. "It's a woefully incomplete picture, ignoring dozens of neighborhoods that have rarely come to the attention of a Conde Nast writer of social justice activist. In the south and west parts of the borough especially, Brooklyn remains the immigrant city the Borough of Homes and Churches that it always was. Over 37 percent of Brooklyn's population is foreign born. From Mexico, Bangladesh, Pakistan, Afghanistan, Ghana, Poland, Guatemala, and Russia, they find jobs as seamstresses, construction workers, and home health-care aides; thousands of others start their own businesses. The cast majority are penniless when they arrive; but like immigrants in the past, they're determined to find economic opportunity for themselves and their kids. Considering that many will succeed in finding what they're looking for, you'd have to conclude that Brooklyn is not just too cities, but many more. "Surprising as it seems to Brooklynites who grew up in the Jewish, Italian, and Irish period, the Chinese are now the largest and fastest-growing of the borough's immigrants. Over the past several decades, hundreds of thousands of immigrants from the Fujian province of China, most poor, many undocumented, have been cramming into dormitories and SROs, working brutally long hours waiting tables, washing dishes, and cleaning hotel rooms, sending their Chinese-speaking children to public schools and on to public universities, if not more elite private ones. The Chinese are changing South Brooklyn's ethnic landscape ever bit as much as hipsters and trustafarians have revolutionized its northern neighborhoods. By turning an abandoned neighborhood into a launching ground into the middle class, they perplex common assumptions about poverty, opportunity, and mobility in an era of bankrupting college tuitions and working-class decline." Hymowitz looks into the question of whether the borough's new wealth can lift up long disadvantaged minorities, and the current generation of immigrants, many of whom will need more skills than their predecessors to thrive in a postindustrial economy. The New Broooklyn's portraits of dramatic urban transformation, and its sometimes controversial effects, offers prescriptions relevant to "phoenix" cities coming back to life across the United States and beyond its borders.